AgroAtlas - Crops - Agropyron pectiniforme Roem. et Schult - Crested Wheatgrass. Agropyron pectiniforme Roem. et Schult - Crested Wheatgrass. Family Poaceae Barnhart. genus Agropyron Gaertn. Agropyron cristatum L. Beauv., Bromus cristatus L.
Fairway crested wheatgrass, Fairway wheatgrass. Chromosome number: 2n = 14, 28, 42. Perennial bunchgrass. Deep, finely branched fibrous roots penetrate to maximum depth of 2.4 m, most roots extending to depth of 1.0 m. Culms are 80-100 cm tall and widely spaced. Leaf blades are flat, usually glabrous; sheaths glabrous or pubescent on lower leaves; leaves rolled in the bud; ligules short and membranous; auricles short, pointed and clasping stem. Seedheads are dense spikelets, with conspicuously flattened heads, 1.5-6.5 cm long, tapering toward tip; spikelets are numerous, overlapping and placed flat-wise on the rachis, 3 to 10 florets per spikelet; glumes are approximately half the length of spikelet; both glumes and lemmas usually taper to a point or short awn. Weight of 1000 seeds is 0.8-1.8 g. Blossoms in June, seed ripens in July. Cross-pollinated by wind. Introduced at end of 19th century. Cultivated on small squares in steppe, mountain, semi- and desert areas in 42 regions and republics of former USSR. State permits 15 breeding cultivars for forage and pasture purposes. Xerophyte. All varieties very resistant to drought, cold temperatures, and heavy grazing. Adapted to well-drained, loamy soils. Grows vigorously in wide variety of soils. Moderate salt tolerance. Alkali tolerance in certain varieties. Low resistance to high water tables. Valuable component of grasses mixtures for cultural long-lived pastures in the steppe and desert areas. 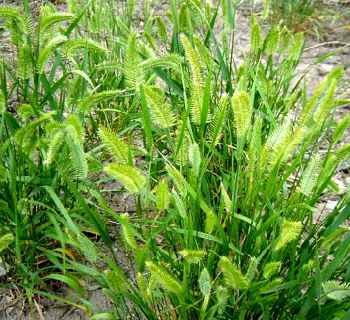 A valuable grass seed component of cultivated, long term pastures in steppe and desert areas. Tall forms used for artificial haylands. Regrows at end of April; therefore, good for early May livestock grazing and early harvest. Highly palatable; provides good forage for all livestock classes. Good regrowth after 3-4 grazings. Highly resistant to grazing if alternately rested. Tends to become fibrous at maturity; palatability and nutritional quality of plant decline in early summer. In some habitats with sufficient soil moisture, crested wheatgrass continues to grow after summer dormancy. Excellent for soil protection; used for fast and reliable rehabilitation of watersheds. Improves soil structure and fertilization. Forage yield approximately 8.0-11.0 MT/ha; dry matter yield 10.0-15.0 MT/ha; average seed yield 100-300 kg/ha. Also used as a lawn grass.